Which is a correct definition? A. Right-of-way at All Times? It is a common misunderstanding that the green arrow signal gives you an absolute right-of-way. Before turning, you must yield to any vehicle, bicyclist, or pedestrian still in the intersection. Be especially careful when pedestrians are crossing the street you are turning into. They may have started crossing with a WALK signal. You should wait until they have safely crossed the street. B. Warns You to Proceed with Caution? Whenever you enter an intersection, you must use caution and look for vehicles and pedestrians who may cross your path. If they are close enough to be a hazard, you should be prepared to stop and yield. A green signal is, however, not a warning signal. A signal light that that warns you to slow down, be alert before entering the intersection, and proceed with caution is yellow. C. Allows You to Make a Protected Turn? The purpose of the green arrow is to let you know that you must turn in the direction of the arrow, if you are in the proper lane and the way is clear. 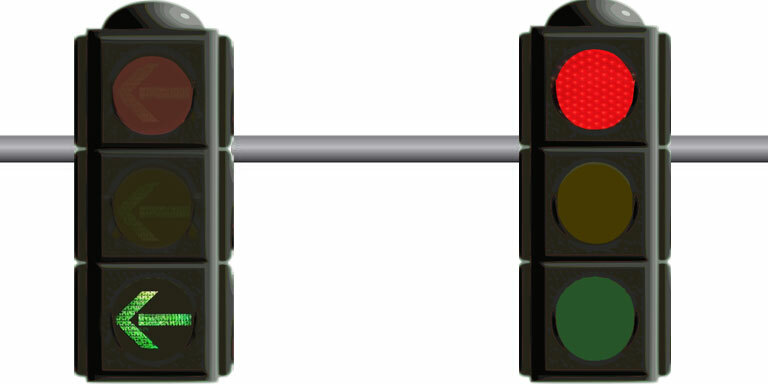 It is known as a protected turn, since oncoming vehicles, bicyclists, and pedestrians are stopped by a red traffic signal light when the green arrow is lighted. Note that not all traffic is stopped. Left-turning vehicles from the opposite direction may also have a green arrow. Make sure you make a tight turn and stay in your lane. Alternatively, vehicles proceeding straight ahead from your direction may have a circular green signal. A very common cause of conflict and crash risk is when a vehicle from the opposite direction makes a right turn on red at the same time as a vehicle turns left on a green arrow. Who has the right-of-way and who is at fault, if it results in a collision? The law doesn’t give anyone the right-of-way. The law only states who must yield. If there is a vehicle making a left turn from the opposite direction, a driver facing a red signal should not proceed against the red light. It is important that the driver making a left turn clearly indicate the turn by using turn signals. A driver not using turn signals is likely to be at fault – or at least partly at fault. The driver turning left with the green arrow signal should only proceed if the way is clear. If it is obvious that a driver has started a right turn on red, the left-turning driver should stay in lane and yield. Follow the discussion with other scenarios at Driver’s Prep. Courtesy and common sense at intersections will help reduce the risk of accidents. Never assume oncoming drivers will yield and give you the right-of-way. Whenever it helps to prevent an accident, let others go first. Disclaimer: the article is for informational purposes only and not for the purpose of providing legal advice. What Does the Yellow Arrow Signal Mean?